Check printing and disbursements is a necessary for all businesses today and we have observed that substantial amount of time is spent by office employees in writing, verifying check details and mailing them, this takes precious time which can be put to more productive tasks. In this digital age we have options that can more efficient and cost effective. 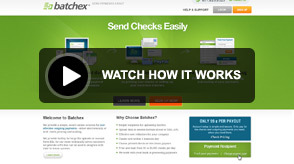 Batchex provides this online service without having the employees to leave their desk at work. Batchex provides secure, simple and sustained solution for check printing, in cost effective way. We pre-establish trust and account information with your company and in two simple steps you can provide beneficiary and amount information to be disbursed on checks. We provide facility for large file uploads or manual form fills, for our more technically savvy customers we provide API’s that can be used to integrate with their in house systems. With our multiple payment options you will find account setup simple and secured. User Login Sign Up Today! Contact us with any question or comments. Do not have a login? Click here for new user Registration. Create your free account in one easy step by filling out the form below.